Is Factor Investing Really a Reliable Strategy? For the Knowledge Factor it is! It’s become common knowledge now that factor investing “works”, but are the most widely used factors really that reliable on a year to year basis? As it turns out, no, they are not reliable on a year to year basis…that is for every common simple factor like value, size, minimum volatility, quality, or momentum. But the Super Factor – the Knowledge Factor – bucks the trend. In the first chart below we show the binary relative out or underperformance outcome vs the MSCI World Index by year since 2000 for the MSCI World Index Factor portfolios and for the Gavekal Developed World Knowledge Leader Index (the Knowledge Factor). If the factor outperformed the MSCI World Index in a year it registers a +1 and a blue line. If the factor underperformed the MSCI World Index in a year it registers a -1 and a red line. 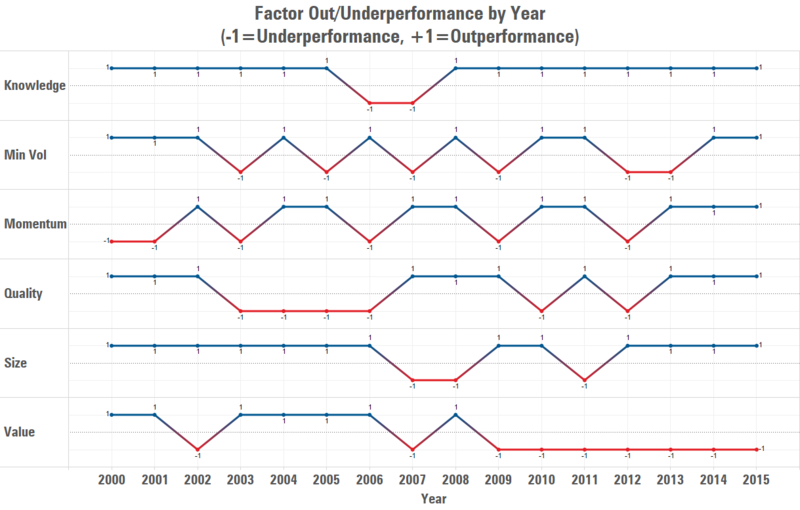 Here’s the takeaway: every factor except the Knowledge Factor (top line) experienced wide variability in binary in year to year relative performance. In other words, no factor except the Knowledge Factor has been able to consistently beat the MSCI World Index. 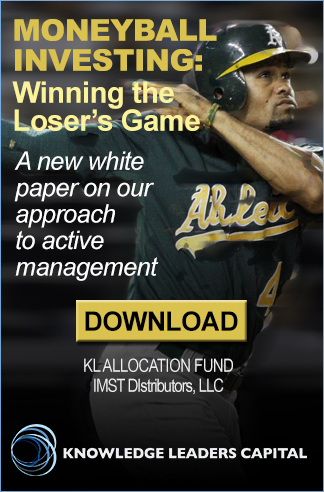 This matters because it makes outperforming with factor investing using the most common simple factors a game of market timing and luck (unless one is willing to tolerate constant variability in relative performance). It also matters because wild swings in performance impact cumulative total return over long stretches. In the next chart we show cumulative total return performance since 2000 for each simple MSCI factor and the Super Factor, the Knowledge Factor. 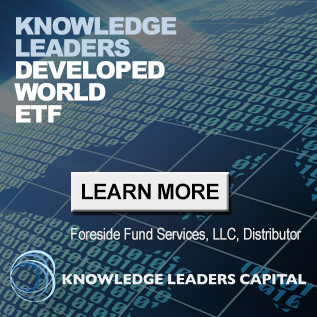 The Knowledge Factor, the Gavekal Knowledge Leaders Developed World Index, has returned 236% over the period compared with the average simple factor returning less than 100%. 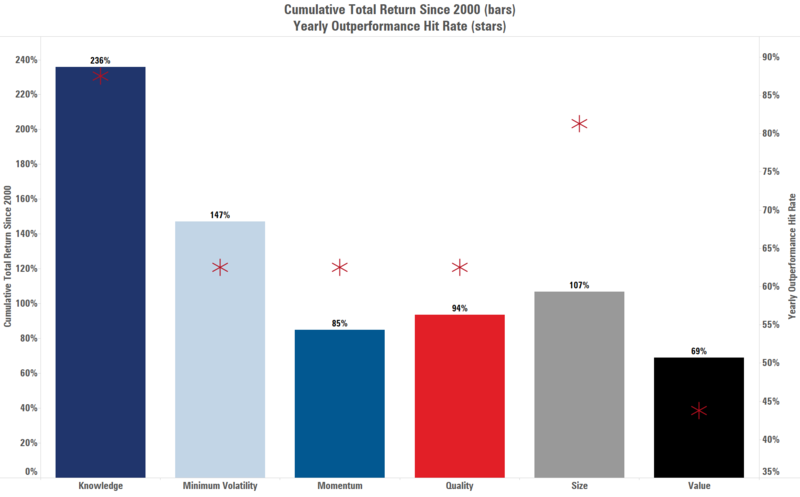 Moreover, the red stars which represent the yearly hit rate of relative performance show that the Knowledge Factor has a yearly hit rate well in excess of any other factor as it has outperformed the MSCI World Index 88% of the time since 2000. In sum, factor investing using simple factors is not for the faint of heart, even for the minimum volatility and quality factors. These factors sometimes outperform and sometimes don’t and the chances of getting an outperforming year are just better than a coin flip. Over long stretches, even for the unusual buy and hold investor willing to tolerate such swings in relative performance, this impacts cumulative total return performance. Only the Knowledge Factor has been able to buck this trend.